Based on the cranes and the background, Dalian I think. 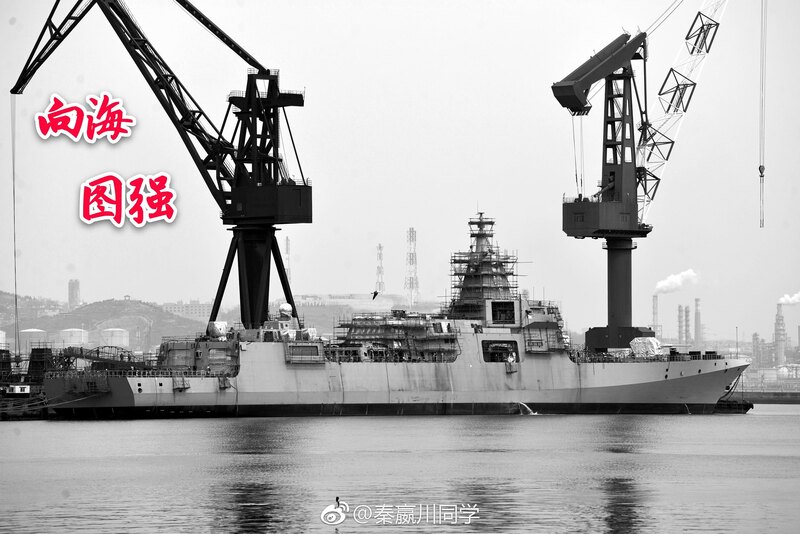 Could be one of the two Type 055s that were launched there. That would be in the current position where this 052D used to be. AF-1, PanAsian, bruceb1959 and 6 others like this. Oh interesting. They already set what I think are the ECM units here. bruceb1959, Jeff Head, duncanidaho and 3 others like this. Higher-resolution versions of previously shared photos. Very high-resolution originals are here and here. PanAsian, davidau, Yodello and 10 others like this. 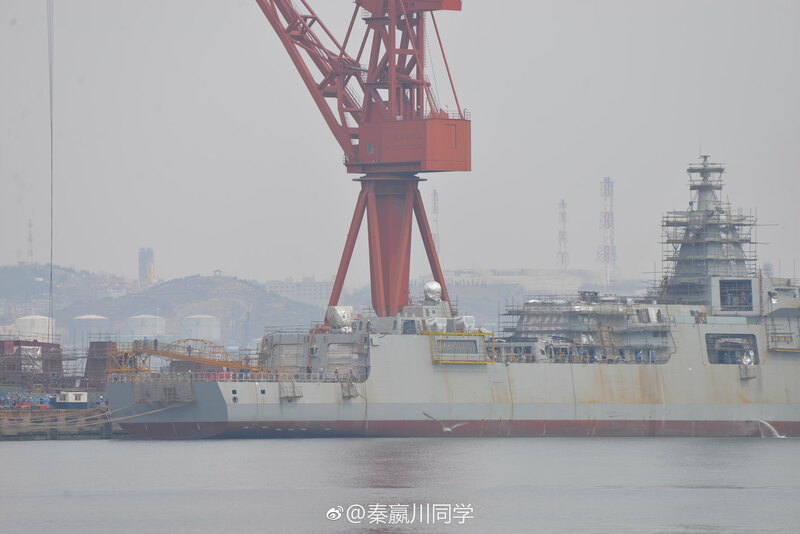 Hull 101 (Nanchang) enters service on April 12, 2019. N00813, Biscuits, Equation and 1 other person like this. That did be doubtful, the PLAN when out of its way to make even the launching ceremony a literal fanfare, for them to commission the first 055 in such a matter with barely a whimper by the media is weird to slay the least. Not weird if the ship is to be presented first at the naval review commemorating the 70th anniversary of the PLAN. Why waste money on two celebrations? I mean you only have to wait a couple of weeks. PLAN would've to come up with a new stealth destroyer to look as cool as the zumwalt. But the zumwalt is limited to only 3 units. So i guess the real competition will be between the next PLAN destroyer and USN's upcoming LSC to present the flagship of destoyers to the world. Zumwalt certainly looks more futuristic but is the limited improvement to RCS (we're only talking surface looks here) worth all that extra room, steel, production cost, time, and complexity for China if they were to wish for a Zumwalt looking equivalent cruiser/destroyer? I doubt it. After all only one of these two are actually in service and continuously being built. The other is a rejected program. The Zumwalt concept is built around the power delivery system and the main guns which were intended to be railguns. The US naval railgun project is still being worked on and they've found a temporary substitution. Without living up to the whole point of delivering enough power to use those two railguns repeatedly and effectively against multiple target types, the appeal of the Zumwalt faltered. Type 055 is designed as a match for AB flight III, and a modular larger competitor that can take on upgrades because PLAN's missiles are not as capable as USN's on paper. 055's size gives it more room for weapons and modifications. The entire incentive for developing 055 is different to Zumwalt. We'll probably see USN's next destroyer-cruiser design be more "conservative" looking. LSCs are totally different vessels. There's nothing wrong with AB design as it is. If they really wanted to upgrade the mast, they can do an MLU of the AB design without having to work with an expensive ground up version. Air defense if the main job for USN while the heavy hitting goes to carrier assets, they want numbers more than they want impressive looking ships. bruceb1959, Gloire_bb and antiterror13 like this. bruceb1959 and ougoah like this.